Present state: Clearance of the overgrown island platform and the passenger underpass started in 2012. A short length of track was laid in the northbound platform in March 2014. 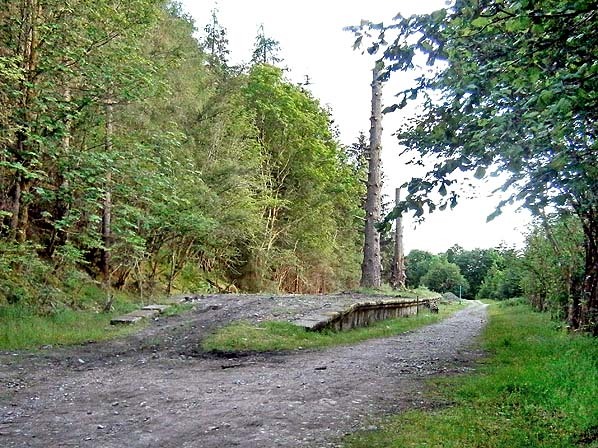 The station area is now a Forestry Commission car park. The station house is now a private residence. 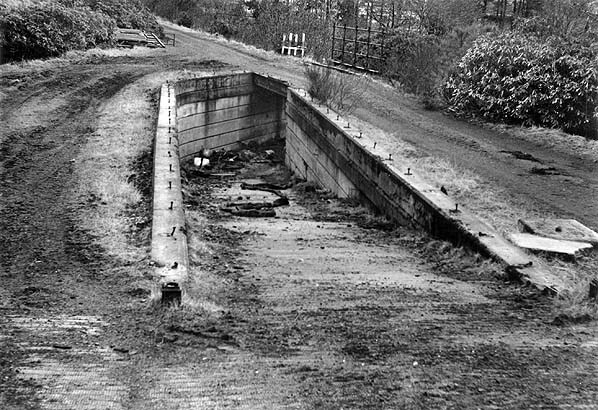 Notes: Invergarry Station had a substantial island platform accessed by a subway or underpass at the south end with a covered ramp up to the platform. 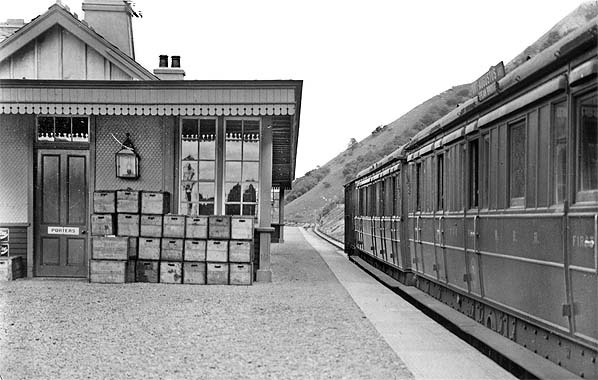 One siding served a goods shed and loading bank on the west side of the station with a second siding on its west side. The station was remotely sited, Invergarry village and house are on the opposite side of Loch Oich.The station was provided with a private waiting room for use by visitors to Invergarry House home of the laird of Glengarry. The house was built north of the ruined Glengarry Castle but is now known as the Glengarry Castle Hotel. After closure to passengers in 1933 the station remained open for goods traffic closing with the line on 1 January 1947, a year before nationalisation. In February 2012 a preservation society was formed. 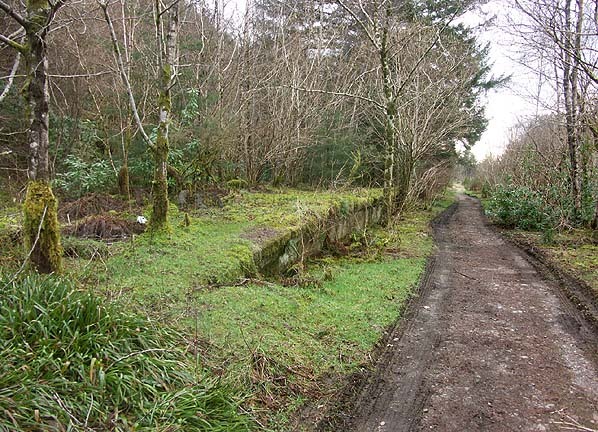 The society's aim was to clear the trackbed of vegetation and create a static museum. 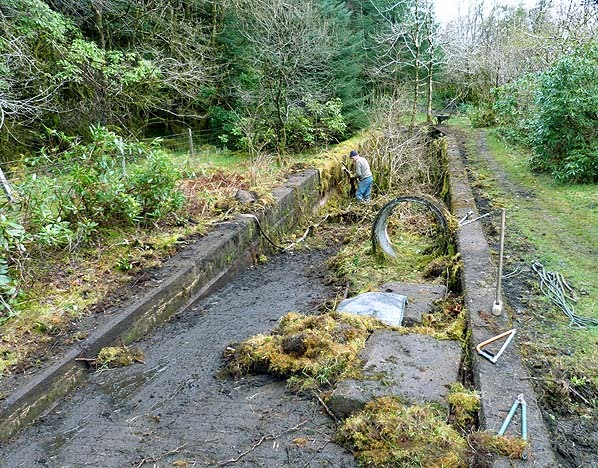 Their volunteers have now cleared the platform but two large tree stumps have yet to be removed. They will soon be ready to excavate the foundations of the buildings. Archaeological digs have already confirmed the site of the toilets, including a cistern from the ladies and the position of the water columns and one pump house. The trackbed adjacent to platform 1 has now been completely cleared as is 90% of platform 2. The underpass has been painted and the surrounding area cleared ready for the installation of a notice board. The Invergarry Station Project enjoys the support of the local MSP, Dave Thompson, The Great Glen Way, Sustrans, Forestry Commission, Historic Scotland, The Heritage Railway Association, Glengarry Heritage Centre and the local community, many of whom are working members of the Society. 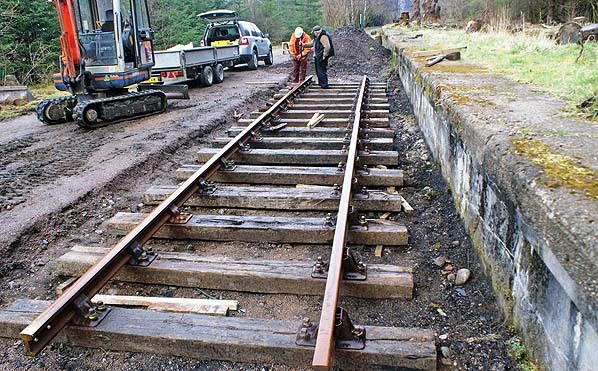 Being sited on both the Great Glen Way and proposed Sustrans National Cycle Route between Fort William and Inverness, as well as being within walking distance of the A82, it is hoped the museum will attract interest from the general public as well as rail enthusiasts. Latest news 1 July 2014: The group been promised 450ft track and at least one set of points. They expect delivery towards end of July 2014 along with ballast. 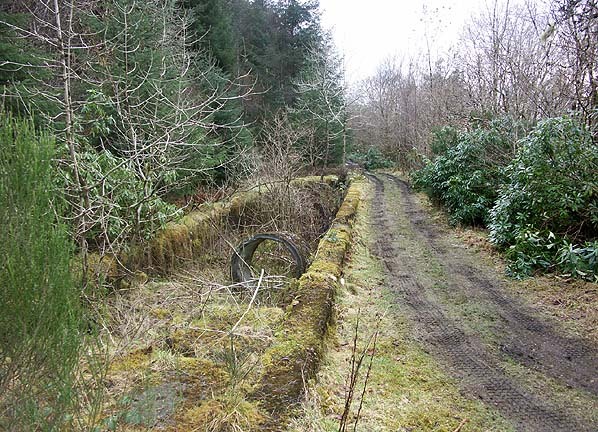 An Inverness firm have agreed to construct a replica signal cabin at cost. 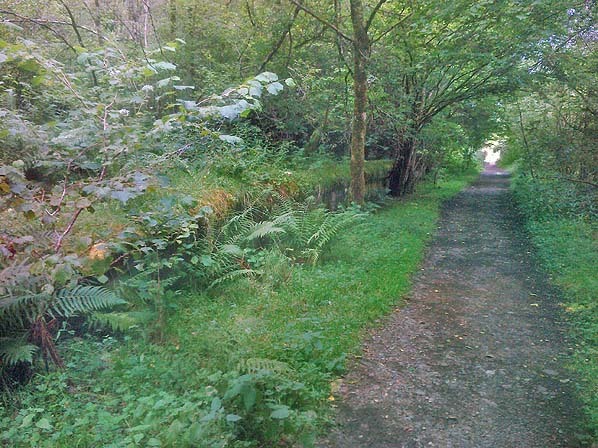 The Forestry Commission have agreed to clear back from the cess to the boundary fence adjacent to platform 2 by the end of July which will enabled the track bed to be prepared. 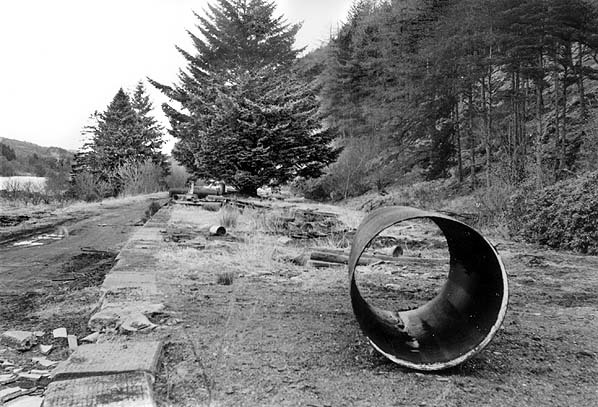 A replica Invergarry Station sign is also currently under construction. 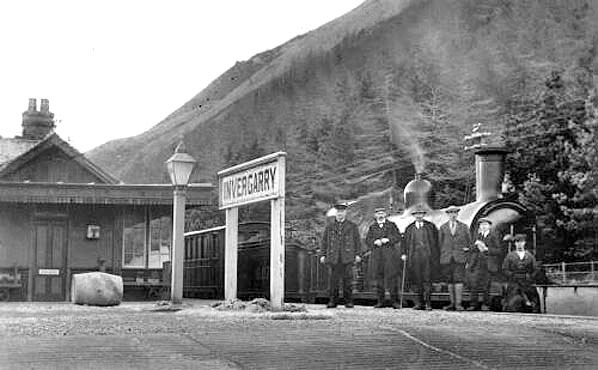 A train from Fort Augustus waits at Invergarry station in 1914. 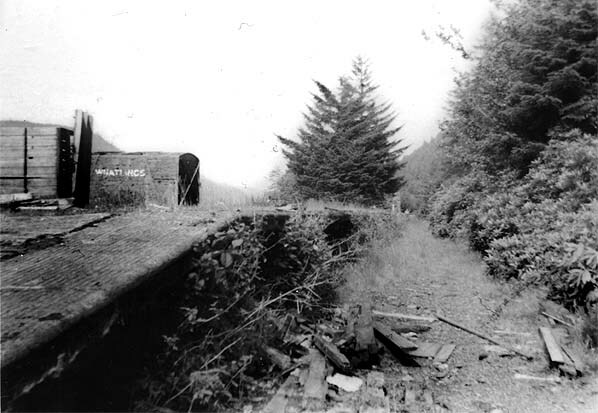 Looking north-east towards Invergarry station in 1931. The unusual underpass is seen with its covered stairway up to the wide island platform. The goods yard with two sidings is seen on the left. 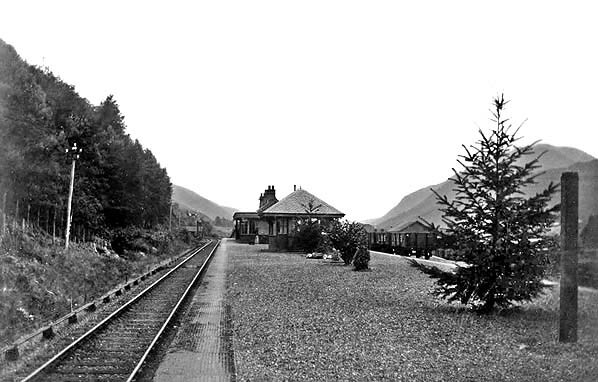 Invergarry station looking south-west c1930s. Note the trees deliberately planted on the platform. See how they have grown in the pictures below. 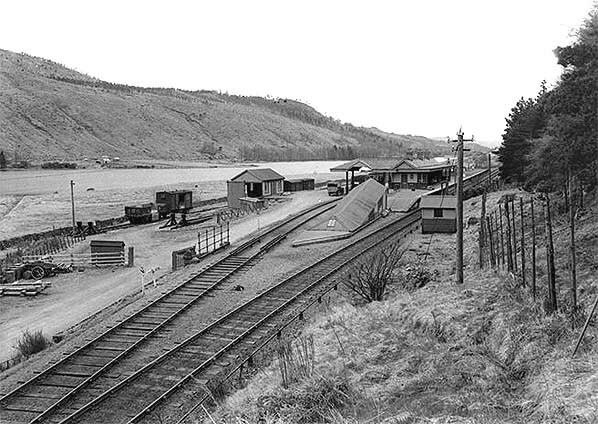 Invergarry station looking north-east in April 1970. The underpass is behind the photographer. The unusual underpass under the northbound line that allowed passengers to reach the island platform. as seen in the 1931 picture above. 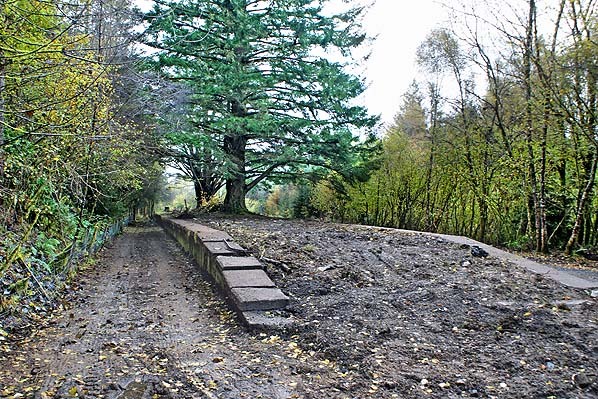 Invergarry station looking south-west in 2011; a year before restoration started. The ramp down to the subway at the end of the first day to clear the site in April 2012. Clearance of the undergrowth on the platform and the southbound track has almost been completed by November 2011. Something still needs to be done about the trees which have been growing on the platform for over 80 years. After 66 years the first track panels are laid to platform 1 on 25 March 2014.